The F120 FDM 3D printer introduces this cutting-edge technology to even the most basic users, transcending many entry-level machines. Stratasys announced, today, the addition of the new Stratasys F120™ FDM 3D printer to its F123 Series. The F120™ brings industrial-grade 3D printing to desktop, environments like offices, educational spaces & labs and even design studios. The new 3D printer will be unveiled at the upcoming Additive Manufacturing User Group (AMUG) Conference 2019 in Chicago. F120™ FDM 3D printer makes industrial-grade 3D printing technology easier to own than ever before for its new-age customers by delivering quality, reliability, & repeatability. Above: The Stratasys F120™ FDM 3D Printer is the newest addition to the full F123 Series/Image Credit: Stratasys Inc. The F120™ FDM 3D printer is the newest addition to the full F123 Series of 3D printers including the F170™, F270™ and F370™. This range of 3D printers combine reliable FDM® technology with design-to-print GrabCAD Print software. The new Stratasys F120™ FDM 3D printer is set to power the new-age designers, engineers, students and educators with an industrial-grade 3D printer. With F120™, Stratasys brings industrial-grade 3D printing to its base customer. 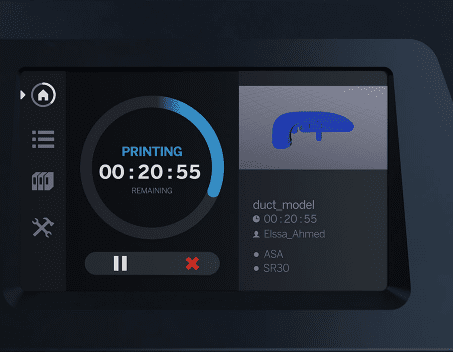 The printer is backed by simple controls, remote self-monitoring, exclusive 3D printing hardware, and with brand power of Stratasys amounting to reliability and repeatability. The printer is suitable to print multiple applications like rapid prototyping to tooling and to full manufacturing. Speaking on the new launch, Omer Krieger, EVP Products, Stratasys, said, “For more than three decades, Stratasys has set the standard for performance, reliability and accuracy in industrial-level 3D printing technology. Some of the largest names in automotive, aerospace, and healthcare count on us to deliver repeatable and accurate 3D prints for both prototypes and end-use parts. Above: Stratasys F120 3D printer can print up to 3X faster than its nearest competitor/Image Credit: Stratasys Inc. While most desktop 3D printers struggle with quality, repeatability and reliability, F120 is supported by 1200 hours of testing of the most important print performance attributes – including part robustness, accuracy, and how well the printed part matches the CAD file. According to an independent study, F120™ can 3D print up to 3x faster than its nearest competitor and holds up to 4 times more material. Stratasys F120™ FDM 3D Printer will be unveiled at the upcoming Additive Manufacturing User Group (AMUG) Conference 2019 in Chicago.